Which is why, tragedy or no, the larger themes of the final film in the trilogy resonate so powerfully with a country that feels nothing but negativity lately. Superheroes like Spider-Man or Superman might get up and tell you how great humanity is at its heart. And they wouldn’t necessarily be wrong. But Batman won’t sugarcoat anything for you. Humanity is worth fighting for; but you have to save it from itself. Moving out of the abstract, this film takes place eight years after the shocking finale of the second movie. When last we saw Batman he was a pariah. The police believed he was responsible for the deaths of Harvey Dent’s victims and Dent himself. He became a villain in the eyes of the public so that their “white knight” of a District Attorney could be used as a symbol to inspire the city to do better. As Gotham celebrates “Harvey Dent Day” and the significantly lowered crime-rate that comes with it, only one question remains: What about Batman? We soon learn that Bruce Wayne has become a Howard Hughes-esque recluse. He feels that he not only failed as Batman, but as Bruce Wayne too. He hasn’t worn the cape and cowl in years, all of the Wayne Foundation’s charities have dried up along with its profits, and he can’t get around without the help of a cane. Batman’s best days are far behind him. In other words: it’d be a bad time for Batman’s greatest physical threat to wage war on Gotham. Picking up where his former mentor Ra’s Al Ghul (who also taught Batman everything he knows) left off, Bane is intent on “giving Gotham back to the people.” Which is a far more romantic ideal than the reality that ends up taking place. Although I suppose fans of martial law and near-anarchy as fueled by the threat of nuclear annihilation wouldn’t see it as a bad thing. Much like the previous film, there’s quite a bit of subtle political commentary at play here. Interestingly, many of the same issues were raised in the first film in the trilogy (which was made several years prior to the economic depression). Bane isn’t wrong when he says that there are some in Gotham who live extravagantly and many who live with almost nothing. But his ideas of what to do about that are highly distorted. Still, it helps to have a sympathetic villain. Even if they’re only sympathetic in a small way. 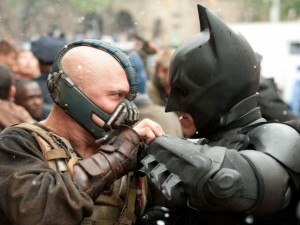 Tom Hardy plays Bane in an over-the-top way, but that’s what makes it effective. Whereas The Joker in the last film was largely doing things just to do them (and prove a larger point about humanity in the process), all of Bane’s actions have a purpose. He has a passive menace to him that can be truly terrifying. Not only is he imposing physically, his whole personality is imposing. Some are having trouble understanding his voice, but I’d say that aside from some moments where he was too loud and the speakers got static-y I didn’t have an issue. He sounds like a man that is impassioned and yet calm. It’s off-putting just as Ledger’s Joker was, although in a very different way. It works. He’s not as good as a villain, but Batman and the Joker might be the greatest rivalry of all time so that’s not surprising. The film also introduces several new characters on the “good guy” side of things. Unusually, this is done well and isn’t a complete disaster. Most films like this fall apart when too many new characters are introduced. First there’s Selina Kyle. Nope, not Catwoman. That name is never uttered within the film. Which is probably good, given that it would have to be a bit of a forced nickname. Played to sultry and dangerous perfection by Anne Hathaway (The Devil Wears Prada, Get Smart), Selina provides an excellent foil for Batman. Is she on the side of good or evil? It depends on which side will serve her interests the most at the time. In a previous (and terrible) Batman film involving the same character, a lot of things were spelled out too much. Such as Batman saying “we’re the same, just split right down the center.” Don’t tell me how similar you two are, show me! And that’s what Nolan does. He lets us figure out what a great team they make, without shoving that fact down our throats. Anne Hathaway puts on a great performance. They never call her Catwoman. Next we have John Blake, who immediately becomes the most likeable new character. This is thanks largely to the acting of Joseph Gordon-Levitt (Inception, 50/50). He’s an orphan and a cop and he still believes in Batman. That might seem like a bit of a perfect storm of sympathy, and thus a cheat to get the audience to care, but the character is played with such a lack of vanity that you’re on his side immediately. He is simultaneously what Harvey Dent should’ve been, what Commissioner Gordon can’t be, and what Batman used to be. His idealism might not survive the trials in the film but it’s a refreshing change from all of the gloom. The other main new character is Miranda Tate, played by Marion Cotillard (Inception, Big Fish). She’s not in the movie that much and she is indeed more important in terms of her relationship with Bruce Wayne than anything else. She represents the type of woman Bruce should be settling down with: rich, successful, and possessing of the business chops to save Wayne Enterprises. Can Bruce move past his distrust of people and settle down with her? Or will the monstrous and cynical vigilante side of him win out? That’s an awful lot of personal stuff going on, and I’ve barely even mentioned the plot. This is why even though the film is a full two hours and 45 minutes, it earns every second. Every plot point and character moment needs to be exactly where it is, and it all pays off in the end. I really don’t want to discuss much more of the plot because it’ll ruin your journey as a viewer. But there are a few more things to keep in mind that I’d like to mention. 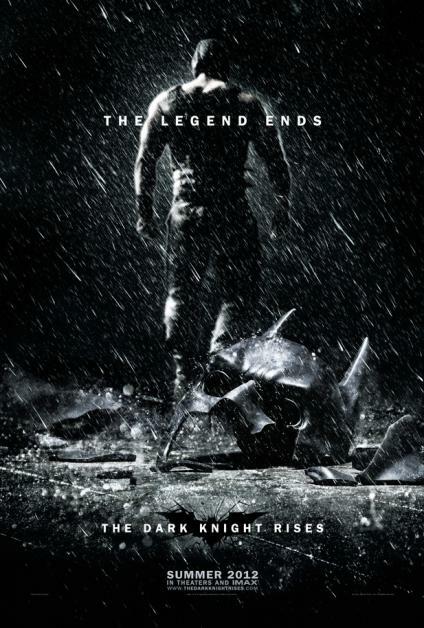 I fully expected this film to be better than Batman Begins but not as good as The Dark Knight. And in my opinion, I was correct. They’re tough to compare because the first movie is a superhero film, the second is a psychological crime thriller, and the third is an epic. But the fact remains that though this was the biggest of the three, the second film is the most personal, the most unexpected, and the most intensely plotted. Don’t let that ruin your enjoyment of this movie. It’s fantastic. And who knows? Maybe you’ll like it more. Another important part of making this film (and the other two) succeed is the music. It’s interesting that in the first film, they said that composer Hans Zimmer was scoring Batman and James Newton Howard was scoring Bruce Wayne. There’s more to both of their work than that of course, but that’s the overall idea. The second film utilized less of Howard’s work than the first. And this movie is all Zimmer. Bruce’s persona is fading, and the music tells us that. Lack of music is also an important musical choice and there are several moments in the film that become highly effective due to the lack of music. It’s not something that the audience is always consciously aware of, but they feel it whether they realize it or not. It’s easy to take a lot of these performances for granted. But they’re all SO good. Gary Oldman was always an amazing Commissioner Gordon. We’ve come to depend on him as being great, but he has some wonderful scenes in this new film that are not to be overlooked. The same goes for Morgan Freeman as Lucius Fox and especially Michael Caine as Alfred. They can all be seen, in one way or another, as father figures for Bruce, Batman, or both. As powerful and influential as he is, he’d be nowhere without these men. And that’s never been clearer than in this film. Which brings us to the man himself: Batman. People have varying opinions about Christian Bale (Rescue Dawn, The Prestige) and his performance. Although I’d say many would agree that his is the best. Michael Keaton is an absentee Bruce Wayne and a tepid Batman (and his movies either sucked or were meh). Val Kilmer was a pretty good Batman but a ridiculously moody Bruce Wayne (and his movie sucked). George Clooney was a great Bruce Wayne but a far too silly Batman (and his movie sucked the most). Well for those who feel that Bale’s “Batman voice” drags down his performance (I’m not one of them): you’re in luck, because you won’t hear it all that much. Batman is used fairly sparingly in this picture. Which is good because if he’s all beaten up and old (or at least old by superhero standards) then it wouldn’t make sense for him to be out there every two seconds. 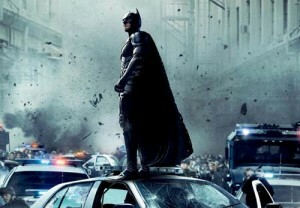 Instead, Bale flexes his impressive acting muscles as Bruce Wayne himself. He both takes us to the place of rage where he finds the Batman within himself and back to the scared child, crying in an alley next to his dead parents. It’s difficult to do this without becoming a parody, but Bale succeeds magnificently. 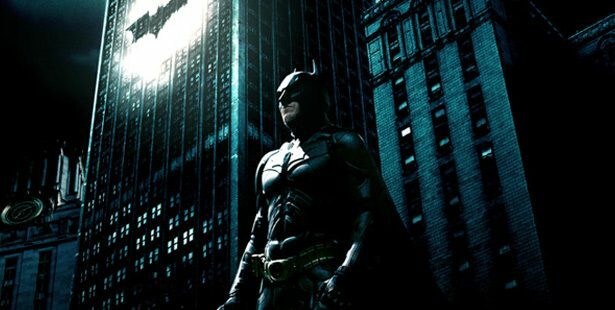 At the time that I’m writing this, The Dark Knight Rises now holds the record for money made at a midnight showing. Whether the recent shooting tragedy will lead to a downturn (or upswing?) in business is hard to say. We’ll see as the weeks roll on. All I can say is that when one demented man tries to impose his distorted worldview on the rest of us: we shouldn’t let him dictate. Batman would tell us to fight back and take away their power at its source by refusing to give them the attention they crave. As long as we keep seeing movies like The Dark Knight Rises, The Amazing Spider-Man, and The Avengers, we’re believing in ideals that are far bigger than ourselves. Because we may feel like the hero who stands alone in a quest for justice, the conclusion of this film shows that an entire city can be moved to action by one man’s example. And that’s something very much worth going to see, whether a madman wants you to or not.